It was a beautiful sunny day, the last day of winter officially, and the perfect time to give our green test roof a spring haircut. Jamie and I got out the weedeater and a rake and went at it Friday at noon. Only one sprinkler head met its demise for the cause. The clippings went out to Kenwood where they were properly composted. Jaime and I got our eco-credits for the week and the roof got its first hearty drink from the irrigation system. With only 4″ of soil the roof had dried out considerably in our short burst of warm weather. Our plan for the spring is perhaps to raise some healthy veggies on the roof garden to enhance our Wine Wednesdays. Stay tuned! 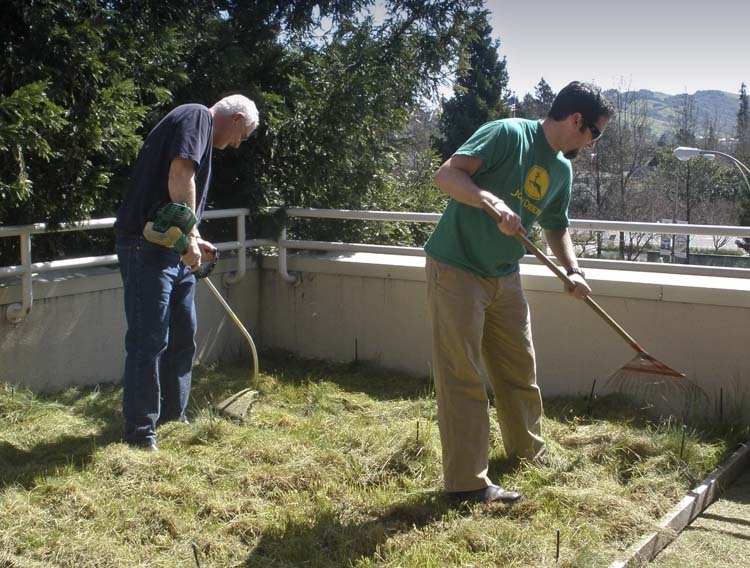 Green Roof Maintenance Crew at Work. Note John Deere T-Shirt. Very cool Alan. Have you heard about iGrow? It’s a new county program that promotes health by helping individuals and groups grow their own vegetable gardens in the area.